Have you been involved in a personal injury accident, such as a slip and fall, and now you are in constant pain? Are you trying to ease the agony yourself via ice packs and pain relievers, yet you can’t quite seem to find relief? A visit to Dr. Russell, your Henderson chiropractor, may just help! 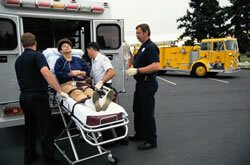 What Happens in a Personal Injury Accident? When your body is suddenly jolted, which is typically what happens with most any type of personal injury accident, a number of things can happen as a result. For instance, your vertebrae can be knocked out of place, a disc can be herniated, a tendon or ligament can be pulled, a muscle can be strained, all of which can cause you a tremendous amount of pain. It is also possible that you suffered some sort of damage to your body and don’t yet feel it. Throw your spine out of place even a little and the effects won’t necessarily be felt for months or years down the road, when it becomes even harder and more time intensive to treat or relieve. If you’ve sustained a person injury to your back, neck, legs, or arms, you’ll want to schedule an appointment with your Henderson chiropractor immediately. The first thing Dr. Roger Russell of Advanced Spine & Rehabilitation in Henderson, NV does with his patients is evaluate them to determine the extent of their injuries. Each situation is unique so he always makes sure he has a clear understanding of the problem before recommending the appropriate course of treatment. Vertebral Axial Decompression (VAX-D), and more! Call Dr. Russell at Advanced Spine and Rehabilitation in Henderson, NV today and start healing from your personal injury accident so you can experience relief and begin to enjoy life again. He will help you take control over your personal injury so it doesn’t take control over you!